(4) for uniformity of results of heat treatment. 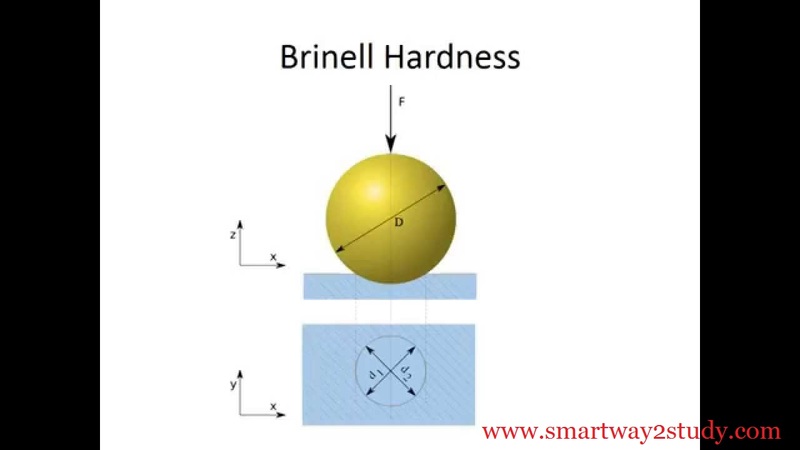 Brinell Hardness Tester: Brinell hardness tester is shown in below Fig. Place the test sample on the top of the test table and rise it with the elevating screw, till the test sample just touches the ball. 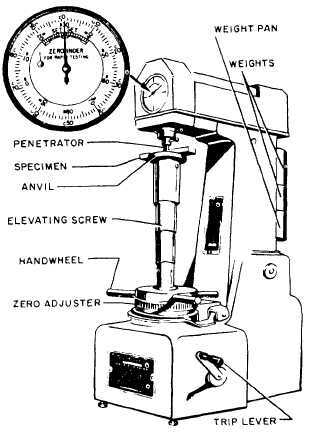 Apply the desired load (about 30' diameter of the ball in mm) either mechanically or by oil pressure. The steel ball during this period moves to the position of the sample and makes an impression or indentation. Measure the indentation diameter at two places, either on the screen provided with the machine or by coinciding the two points of a reading microscope. Using above equation, one can calculate BHN after substituting the values of P, D, d.
(1) The Brinell test should be performed on smooth, flat specimen from which dirt and scale have been cleaned. (2) Successive impressions made too close to one another tend to produce high readings because of work hardening. (3) The test should not be made on the specimen so thin that the impression shows through the metal nor should impressions be made too close to the edge of a specimen. It is widely applied in the industry due to the rapidity and simplicity with which they may be performed. High Accuracy achieved and due to small size of the impression produced. 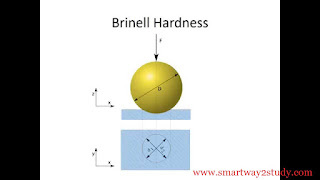 Also Rockwell hardness number can be converted to Brinell number using special table or chart. It can be used both for hard and soft material. The test machine is very heavy. The area of indentation is quite large that it affects the surface quality. This is why, some it is considered as a destructive test. The thickness of the test sample also limits its use, e.g., thin sheets will bulge or be destroyed during the test. For very hard materials, the test results are unreliable. The ball gets flattened on hard surfaces. One faces difficulty in measuring the indentation diameter accurately.